CreekSide has a variable pricing structure for wedding events. Pricing is designed to provide choices for couples that meet their preferences and needs. The 7-acre property has a number of locations to choose from: a climate-controlled banquet hall, a barn and a gazebo. The buildings are original, built in 1918. The property includes spacious lawn areas, an old growth timber groomed for events and a meadow behind the barn. A Wedding Price Guide is available upon request. CreekSide was built as a community gathering place in 1918. Situated next to the Landon Trail just three miles south of Topeka, the 7-acre property hosts weddings from mid-March through mid-December. 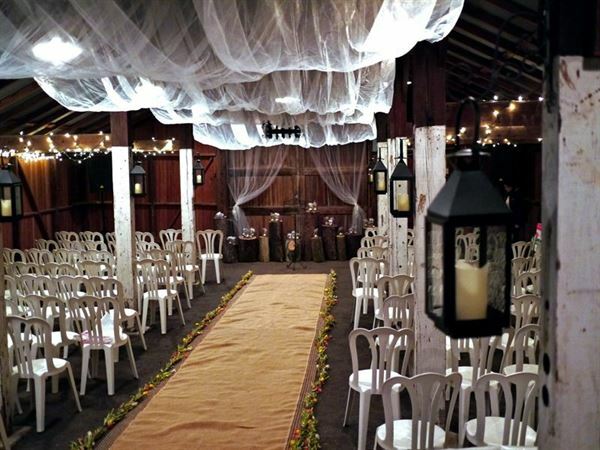 There are many options for events: the banquet hall with its original boxcar siding and pine floors; the barn which opens through wide doors to a spacious lawn area and a meadow with string lights and a gazebo in a groomed old-growth timber. Guests may use all or part of the property and pricing is structured to provide options that meet preferences and needs. Owners, Ron and Roxanne Davis, purchased the property in 1984. Hundreds of weddings have been hosted at CreekSide in the past three decades. Atmosphere/Decor: Natural authentic vintage buildings; highly shaded pastoral outdoor areas. Floor Covering: Hall-original pine; Barn - composite. Special Features: Owners, Ron and Roxanne, are committed to providing personal service that ensures a memorable event. Couples are encouraged to use imagination and inspiration to tailor events to meet their own creative vision for their day.